As you’re preparing for your next trip on the water, don’t overlook the very important boating safety kit. You may think you don’t need to spend time putting a kit together when you can just go buy one, but that’s not exactly true. A purchased kit should be a starter that you add to in order to create a boating safety kit you can rely on. Whether you’re experienced out on the water or just beginning, having a solid boating safety checklist you can go over each and every time you’re on the water is the first step in safety preparation. Anyone who has a difficult time swimming needs a well-fitting life jacket while they’re on the water. It may be a good idea to wear one, even if you can swim, if you are dealing with some unpredictable waters. A throwable floatation device should be included in your boating safety kit. Be sure you have the recommended type for the waters you’ll be on. You may need to help someone you brought with you or even a stranger out on the water. 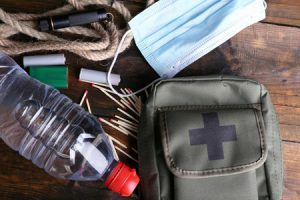 Visual distress signals such as flares or flags should be included in your kit even if you aren’t required by the Coast Guard to have them. You never know when you’ll get stranded or have a need for them. If you’re just going on a canoeing trip with us at Mattice Lake Outfitters, you won’t need an extinguisher. However, if you’re going on a boat that has fuel or is fuel powered, you’ll want a marine-type extinguisher just in case. We want you to have a good time and be safe when you book a canoe trip with us. So, pack your boating safety kit and give us a call at 1-800-411-0334 to schedule your adventure today!